Los Angeles - Serena Williams, feeling "new power" from her pregnancy, is already preparing for an Australian Open title defence in January. 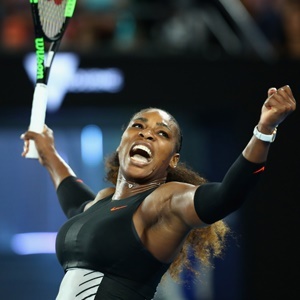 In a wide-ranging interview with Vogue touching on motherhood, body image and race, Williams said she had set herself a goal of playing Melbourne. "It's the most outrageous plan," the 36-year-old Williams, who is expecting her first child next month. Williams said during her pregnancy layoff she had kept a close eye on the tennis world, including her sister Venus's run to the Wimbledon final. And she has her eye on matching Margaret Court's all-time record of 24 Grand Slam titles. She was already pregnant when she won her 23rd at the Australian Open last January. Williams says she's had a "love-hate relationship with the idea of power" as it relates to her game, sometimes irked that her skill and strategy seemed to be overlooked. "As I've gotten older I've started to feel differently about it. Power is beauty. Strength is beauty. So now on the court I want people to think that I'm powerful," she said. But she's dismayed to think that many interpret her on-court determination as "mean" - something she believes has to do with race. "I feel like people think I'm mean," she says. "Really tough and really mean and really street. I believe that the other girls in the locker room will say, 'Serena's really nice.' But Maria Sharapova, who might not talk to anybody, might be perceived by the public as nicer. Why is that? Because I'm black and so I look mean? That's the society we live in. That's life. They say African-Americans have to be twice as good, especially women. I'm perfectly OK with having to be twice as good."